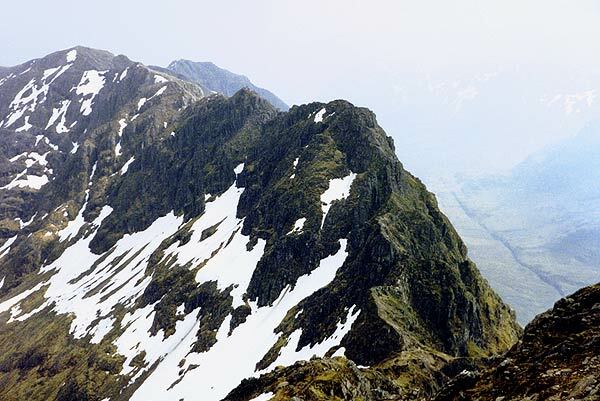 Sgorr nam Fiannaidh and Meall Dearg are two Munros separated by a narrow rocky and exposed ridge known as the Aonach Eagagh (Notched ridge) on the side of Glen Coe. As there is no easy way off the ridge between these peaks they are normally climbed together. Sgorr nam Fiannaidh can be ascended without traversing the ridge by an approach from the Clachaig Inn. From the summit the ridge runs WSW, then branches SSW and NW. The NW branch leads to a broad col linking to Sgorr na Ciche (Pap of Glencoe) and a route from Sgorr nam Fiannaidh leads down the ridge towards the col but bears W to the road returning to the Clachaig Inn. Also from the SSW branch, a route leads E into the high corrie then descends SSE to the road. 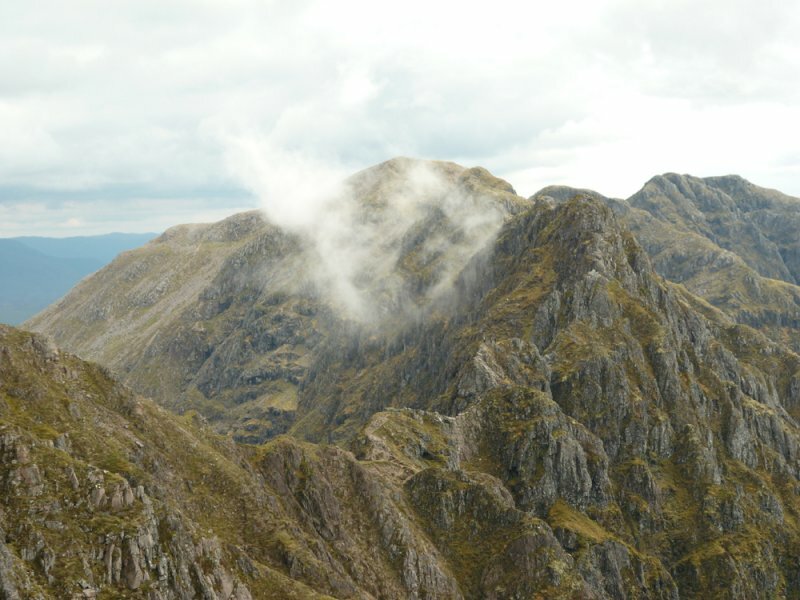 The Aonach Eagach ridge seen from the west. Stob Coire Leith, with ridge to Sgorr nam Fiannaidh going to left and Am Bodach (Mamores) behind, seen from the summit of Stob Coire nan Lochan. Aonach Eagach from west side. 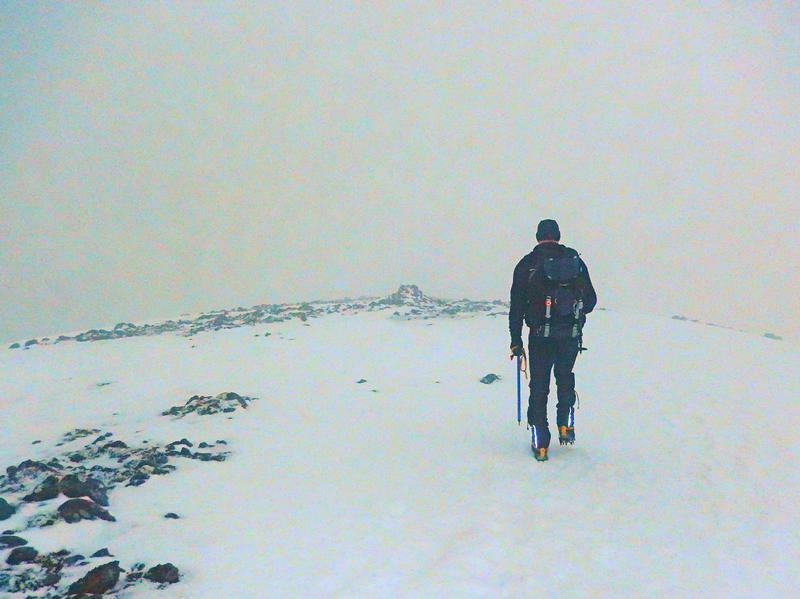 The summary information of one or more ascent routes that include Sgorr nam Fiannaidh. 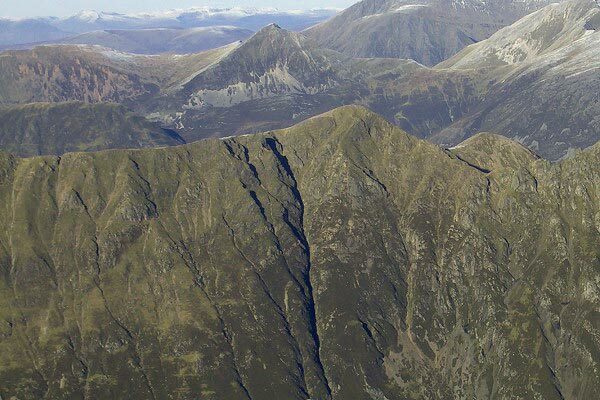 1 1295 m 11.39 km 4.5 hrs Sgorr nam Fiannaidh and Meall Dearg The Aonach Eagach (notched ridge) is Scotland's classic ridge walk. It is a difficult route requiring scrambling skills and an ability to cope with exposure. 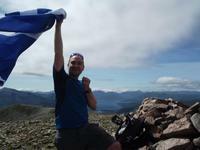 Meall Dearg then Aonach Eagach ridge and on to Sgorr nam Fiannaidh. 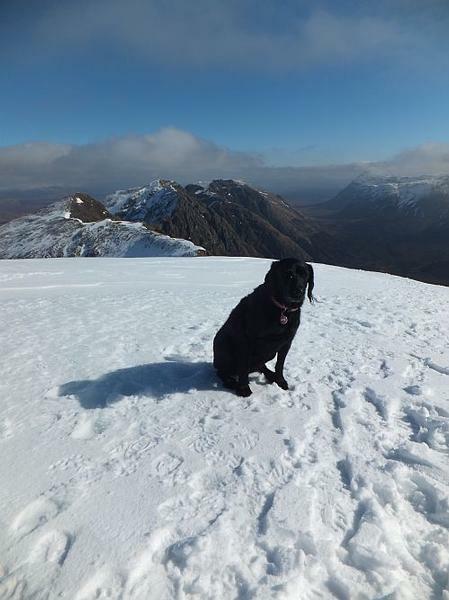 Jorja at the top of Sgorr nam Fiannaidh. March 2015. Post a few words about Sgorr nam Fiannaidh or read what others have had to say. there is now a good path right off the end of the ridge into col at pap of Glencoe comes out about quarter of a mile from the youth hostel or else further into the village depending on which branch you take. a better alternative that the Clachaig gully for a safe descent if you have two cars or a bike. this was not as exposed or daunting as I thought it would be, just a lot of relentless work. the path to the north of last pinnacle drops a lot more than we expected before rising again steeply. My 3rd traverse of this outstanding ridge.Like last year, the weather wasn't great but you don`t notice the weather as all your attention is focused on the next move.There is no let up.You must concentrate on everything you do.Looking back on each completed section is a massive reward,knowing you have just done something rather special.Despite becoming more familiar with the ridge i had a near miss when i slipped about 10ft off a slippy slab going down to the bottom of a steep col prior to the pull up to Stob Coire Leith. Saved from disaster as my Mates were already down and broke my fall. A reminder that this Mountain bites if you get to confident. Day started off with loads of clag but turned into the best day of the year so far.. After completing the ridge you will never want to climb another grassy hill. Easily my favourite so far, will be a hard one to beat.. Final thought, don't believe the hype. Yeah it can be a little exposed in places, but no where near the level of brown trouserness indictaed in most books!..Get out and try it, well worth it. Best day out on the hills I've had. Clag threatened but went that wispy dramatic way throughout the day. The scrambling here was 1st class, nothing too difficult but could see why hillwalkers may treat the ridge with trepidation, not for those with a fear of heights. Conditions were slippy so care was taken on some of the more technical scrambles. The crazy pinnacles were great fun, we were constantly looking back, suprised at what we had just scrambled up or down. The views were breathtaking (and I dont use that term lightly). 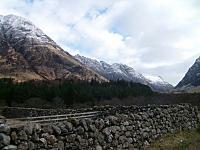 Glen Coe is my favourite range in Scotland and Aonach Eagagh just proved it. 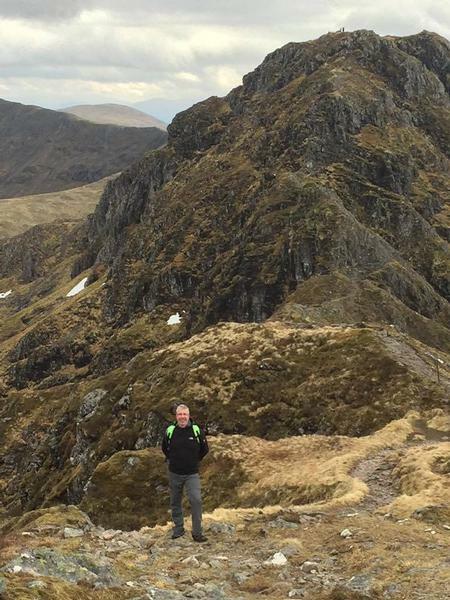 Its not often that a ridge outshines the Munro, here it does...I'm not going to write anymore... just do it!